So, for those of you who are fans of Science Fiction, and all its subgrenres, Bitten is coming to the SyFy Network. 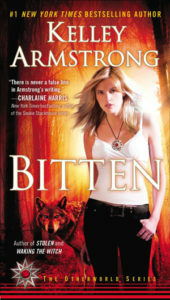 Bitten is the first book in Kelley Armstrong’s Women of the Otherworld series. Written in first person, Bitten follows Elena Michaels as she’s called back home from the life she’s trying to create in the normal world to the life she has tried to leave behind. Elena is a werewolf, reportedly the only known female werewolf in the world, and she’s not one by choice. We learn that Elena was turned without consent and without knowledge by the only person she trusted, her boyfriend Clayton Danvers. Please don’t let this Harlequin-sounding plotline turn you off. The writing is exceptional. I got the sense that I understood Elena, even if I didn’t always agree with her flawed reasoning. And the fact that the entire book happens in her voice, in her mind and from her perspective, is genius for this type of book. I am a fan of the Urban Fantasy genre, which basically means books about supernatural/paranormal/science fiction that are set in the “real world” instead of a completely made up one. Think Twilight, Vampire Diaries, and yes, even to an extent, Harry Potter. Books that take the world we see everyday and add witches, vampires, werewolves, angels, faeries, creatures from outer space and things that go bump in the night. Armstrong’s series is one I recommend without reservation. I’m always more than a little apprehensive when one of my favorite books is turned into a television show or a movie. I almost always hate it. In fact, it’s gotten to where I try not to read the book if I know a movie is on its way. I always enjoy the movie much more if I go in ignorant of what the original author wrote and not what the screenwriter or director created as an interpretation. This caution is especially evident when there’s a strong female character. I love Elena especially because she’s trying so hard to delude herself about what she really wants and what her options are. Ultimately, she is Clayton’s mate, his equal, and, eventually, the pack alpha… but that’s more than a dozen books into the series, and a lot of spoilers. I have read that the show isn’t a series so much as a 13-part serial covering the first book. Regardless, I am going to watch because I am curious. 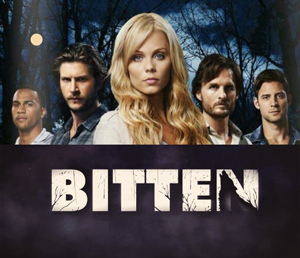 The show premieres Monday, January 13, 2014 10/9c on the SyFy Channel. Photos courtesy of Bitten TV Show, via Facebook.